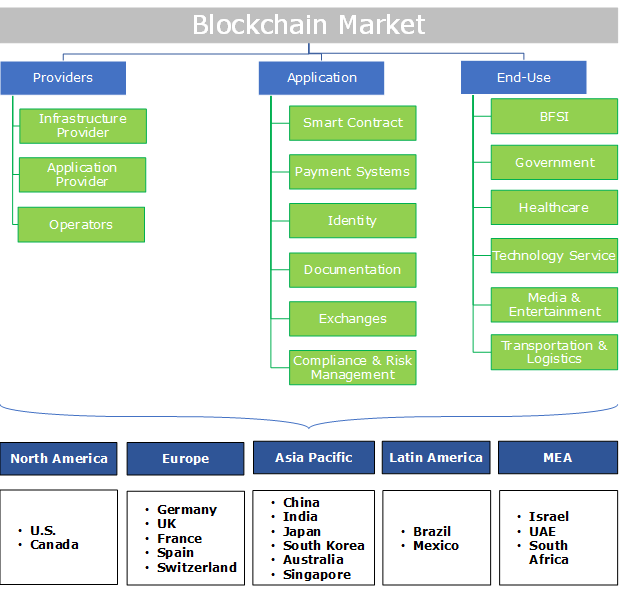 Blockchain Market size was estimated to be over USD 200 million in 2017 and is anticipated to grow at a CAGR of more than 75% over the forecast timespan. The blockchain market is driven by the growing adoption of the technology by financial institutions. The technology is disrupting the financial industry by modifying the business operations and developing new business models. It can significantly reduce the cost of operation and enhance the efficiency of several applications such as trade finance, cross-border payment, documentation or KYC, digital identity management, and collateral management. This is encouraging the financial institutions to adopt the blockchain technology to optimize the business performance. The increasing market capitalization of the cryptocurrency is also propelling the market growth. Over the past couple of years, a rapid surge in the cryptocurrency market has been witnessed. In 2017, over 300% increase in the market capitalization was observed. As a result, various industry verticals and developers started exploring the potential of the underlying blockchain technology for various applications. Furthermore, the rise in investments by venture capitalists in the blockchain technology and numerous benefits offered by the technology are also some of the major forces that augment the blockchain market growth. However, the limited scalability of the blockchain platform is a major constraint in the growth of the market. As blockchain is a decentralized platform, during which the payment process occurs in every node of the network, maintaining the copy of the entire state. This makes the process more complex and time-consuming. Moreover, the stringent government regulations on the trade of the cryptocurrencies and blockchain technology along with the data safety and security issues associated with the technology are hindering the blockchain technology market growth. The infrastructure provider accounts for over 65% share in the blockchain market. The infrastructure providers develop core software building blocks, which are essential for the network to be deployed. The growing demand for the blockchain protocol and standard is a major factor that supports the market. These protocols assist blockchain network and application developers in building customized distributed ledger network for their customers. The application providers are anticipated to grow substantially during the forecast timespan at a CAGR of over 85%. The application developers develop applications that run on top of the existing blockchain networks. The market is driven by the ability of the providers to deliver noteworthy value to the enterprises by minimizing the transcription data duplication and offering timely authentication and reconciliation for regulatory purposes. Payment & wallet is leading the application landscape with over 50% share in the blockchain market in 2017. The growth is attributed to the ability of the blockchain technology to reduce the cost, provide transparency, and improve the efficiency of payment systems. It ensures trusted bilateral transactions between relevant parties. Furthermore, the technology also eliminates the middlemen such as third party authorization and central agencies from the payment processing, which is also augmenting the demand for the technology. 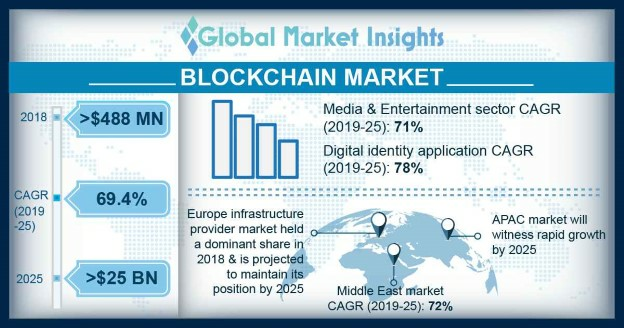 Digital identity is anticipated to be the most lucrative application of the blockchain market with over 90% CAGR during the forecast period. The increasing risk of the cyber security risk attacks is the primary factor driving the adoption of the blockchain among digital identity detection platforms. Moreover, the lack of online identification systems for securing personal identities and the increasing demand for secure and trustworthy international identification system are fueling the demand for blockchain technology across identification platforms. The BFSI sector is dominating the blockchain market with more than 60% share in the revenue in 2017. The financial institutions are leveraging on the capabilities of the technology to reduce the cost, identify new business avenues, and compete with the non-traditional financial players and fintech start-ups. It has been estimated that the blockchain-enabled process can assist the banking and financial service sector to save up to USD 20 billion annually in the infrastructure cost. The blockchain technology provides an omnichannel banking experience for their customers. It can effectively reduce the time per transaction by eliminating the middleman from the payment process. The healthcare sector is anticipated to grow at a CAGR of over 85% during the forecast timeline. The blockchain technology enhances interoperability across the global healthcare industry by eliminating the system boundaries & geographic limitations. It allows patients, the healthcare community, and researchers access to a shared data source to obtain timely, comprehensive, and accurate patient health data. Moreover, it also supports a wide variety of health data sources such as EMRs, wearable sensors, documents, and images. North America is the leading region in the blockchain market with more than 50% share in the revenue in 2017. The growth is attributed to the high venture capital investment in the blockchain space. The U.S. accounts for approximately 54% share in the global blockchain investment between 2012 and 2016. Furthermore, the region is the hub for the technology base start-ups and angel investors. In the year 2016, North America accounts for more than 45% blockchain start-ups across the globe. The early adoption of the blockchain among the industry verticals for the implementation of the payment and wallet solution, smart contracts, and digital identity detection, and documentation application also supports the market. Furthermore, government initiatives present in the region for the implementation of the blockchain technology among the public institutes also will drive the market. Europe holds over 25% share in the blockchain market. The growth in the region is driven by the adoption of the blockchain technology among the financial institutes. The banks and other financial institutes are rapidly adopting the technology to streamline the business operations and minimize the cost of operations. The blockchain market is highly fragmented due to the presence of a larger number of start-ups in the space. The start-ups dominate the market space, amounting to more than 60% of the market share in 2017. The multinational companies are focusing on mergers and acquisitions to enhance the technical expertise, talent, and product portfolio. The key vendors of the blockchain technology are IBM, AWS, Microsoft, HPE, SAP, R3, Peer Ledger, Ripple, Abra, Alphapoint, Amazon Web Services, Asta Solutions, Bacoor, Bitfury, BitSE, Blocko, Blockstream, Bloq, BTL Group, Chain, and Coinbase. The start-ups are focusing on organic strategies to gain the market share. Partnerships and collaborations are the common strategies used by start-ups to gain the market share. For instance, in 2018, R3 collaborated with HSBlox, a technology firm that offers services in healthcare to develop a new blockchain initiative for the healthcare industry based on the Corda Healthcare Community. Whereas, the multinational players are adopting the non-organic growth strategies to gain an edge over the competitors. For instance, in January 2018, IBM announced a joint venture with Maersk Group for implementing blockchain to improve the global trade and to digitize the supply chain. The blockchain technology is an emerging technology of distributed database that records all the transactions & digital events executed & shared among numerous contributing parties. It is dissimilar from other distributed databases as it is intended to attain a reliable & dependable agreement over a record of statement among autonomous stakeholders, who have diverse objectives & motivations. It permits transfer of digital files without depending on a central monitoring entity. This allows the members to prove the content of the database at a precise moment. This guarantees that all the members have a constant view of the collective database. As a result, any unsuitable altercation of information can be instantly detected and rejected by all the applicable participants.